Publisher: Gallery Books, New York, 1990. Hard Cover, 208 pages, 9.50 x 12.00. 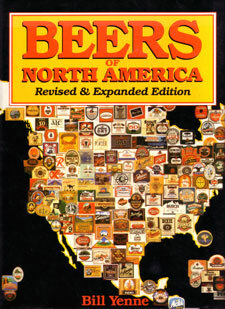 Here is the Revised and Expended edition of Bill Yenne's Beers of North America -- probably one of the most visually stunning books published on the history of breweries. It's filled cover-to-cover with oversized color and black & white pictures which really drive home the richness of brewing history. The choice of illustrations is superb. Provides a general overview of the development of brewing, mostly in the U.S., but with good coverage of all of North America. This book is a joy to look at.